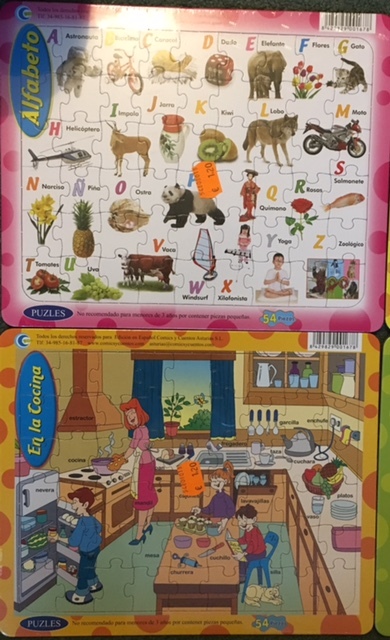 At the Language Show last week, I discovered Educandy on the Linguascope stand. A free interactive activity making site and app, Richard who was running the stand assured me it was really simple to use – and he was right! I’ve just had a go at creating an activity in each of the types: Words – input a list of words and play Anagrams, Hangman or Wordsearch. Matching Pairs – input pairs of words and play Noughts and Crosses, Crossword, Match up and Memory. Quiz – input questions, the correct answer and three red herrings for a Multiple Choice quiz. Below are quizzes I have created (each took about 3 minutes) around adjectives ready for Y6 next week. Once created, quizzes can be accessed via a code that you can give pupils to input here, by URL, or by embedding them in a site (as I have here.) You can also export your activities to use on similar sites e.g. Quizlet, and import from those sites too. I’d encourage you to have a look at the site and try for yourself. It’s free after all so what do you have to lose but a few minutes of your time. On my trips to Spain I’m always in search of a bargain! 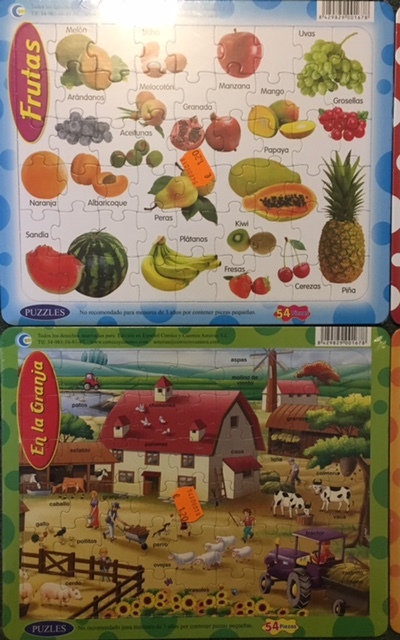 I’ve recently not had much luck finding ‘Poundland’ type shops, nor the equivalent of a Swiss brocki but this time I came across a 1 euro shop down one of the Siete Calles in Bilbao. Disappointingly there were no books, and unfortunately I was down to my last few euros. However, I did find some bargains. 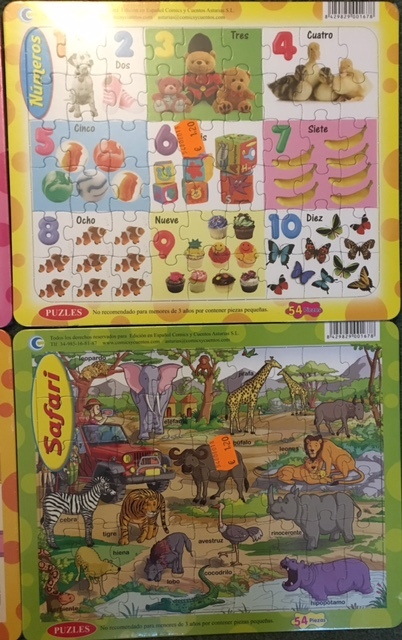 Firstly some vocabulary jigsaws. 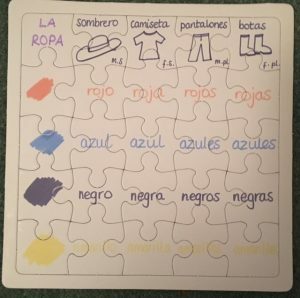 Following on from a tip from Eleanor Abrahams-Burrows at ILILC a few years back, I bought some blank ones from Wilko (also available from Flying Tiger) and made some bespoke vocabulary jigsaws for early finishers/take home Spanish bags/ to reinforce grammar points. My second purchase was a pack of cards. 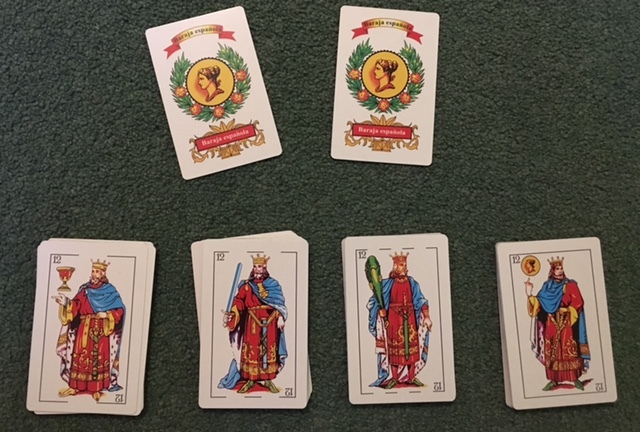 I’ve got lots of decks of cards already, but this my first ‘baraja española.’ As you can see, they are not the same as the ‘baraja francesa’ with which we may be more familiar. There are four ‘palos’ or suites – oros (coins), copas (cups), espadas (swords) y bastos (sticks) – of 12 cards each. The different ‘palos’ are also distinguished by the number of breaks in the line around the edge of the card: oros -0; colas – 1; espadas – 2; bastos -3. 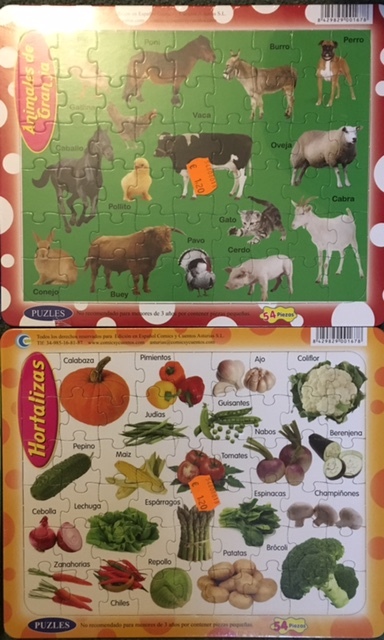 And, in contrast to the 52 card ‘baraja francesa’, there are only 48 cards in the ‘baraja española’ as, whilst there are three ‘figuras’ – rey (king), caballo (horse) and sota (jack) – there is no card marked 10. If you’re interested in the history of them, the Spanish wikipedia entry is very interesting. Here’s a post with some ideas on how playing cards can be used in language learning. ¿jugamos otra vez? – shall we play again? apuesto… puntos/fichas – I bet …. points/counters. pick two cards; what’s the difference? Do you have any favourite card games that you think could be used in the language classroom? PS Loving these ‘naipes’ GIFs! Thanks to Joe Dale for the photo (and video later)! 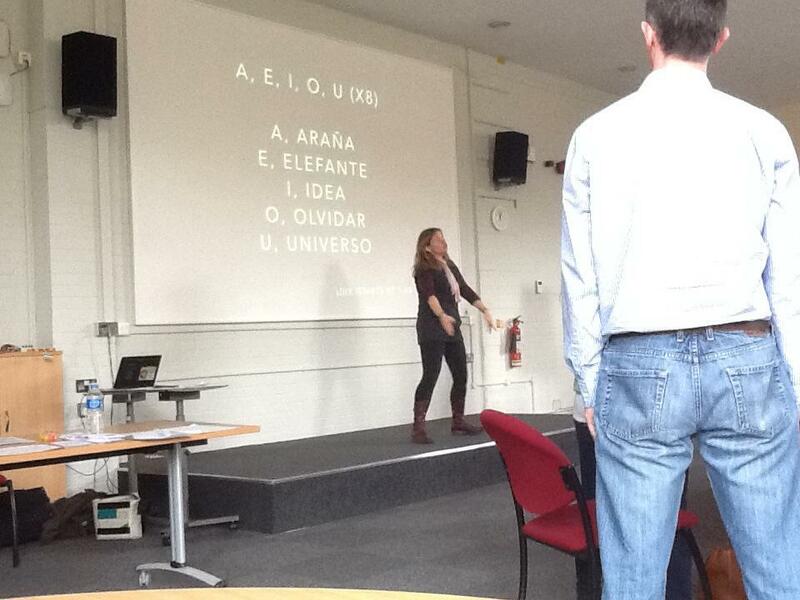 I had the privilege on 28th March to speak at the South West London Primary Languages Conference #SWLPLC. 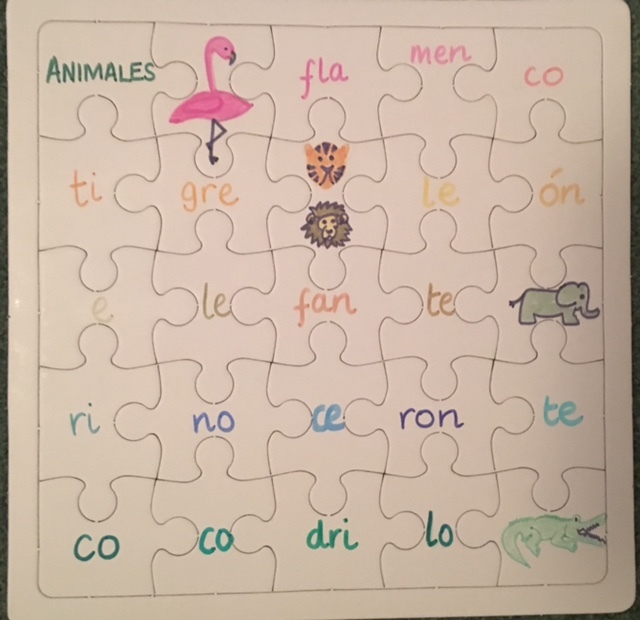 My talk was entitled There’s more to PLL than ‘that donkey’ (Tip Top Tips for Primary Language Learning) and took inspiration from my son who when asked what he’d done in French usually replied “oh, we did that donkey again”. 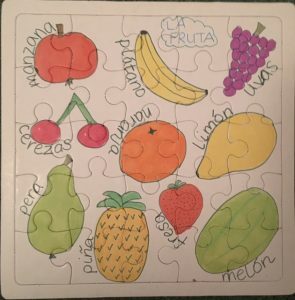 I have nothing against Mon âne but there’s more to PLL than singing as I went on to explain, sharing some of my favourite activities and ideas. Below is my presentaion and links to resources I used and sites I referenced. A lovely day and well worth the early morning; great to see Joe, Rachel, Carmel and finally meet Ceri and Sue, and also to have so many positive comments about Primary Language learning flying around the room. 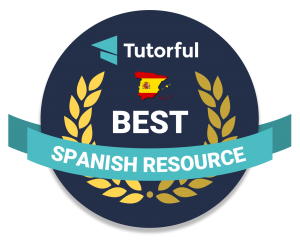 I didn’t get to share my Pinterest pages as they were blocked by the firewall, but here’s the link to my Roman resources for Spanish. And if you flick through, resources for lots of other topics/themes too. Storybird – make up your own stories using illustrators images. Thanks to a lovely FLA (foreign language assistant) who attended my course yesterday I’ve discovered Semillitas de Aprendizaje. And I love it! Semillitas de aprendizaje (little seeds of learning) is part of RiF (Reading is Fundamental), a non profit organisation with the aim of nurturing a love of books and a rise in literacy across America. Our vision is a literate America in which all children have access to books and discover the joys and value of reading. To motivate young children to read by working with them, their parents, and community members to make reading a fun and beneficial part of everyday life. RIF’s highest priority is reaching underserved children from birth to age 8. 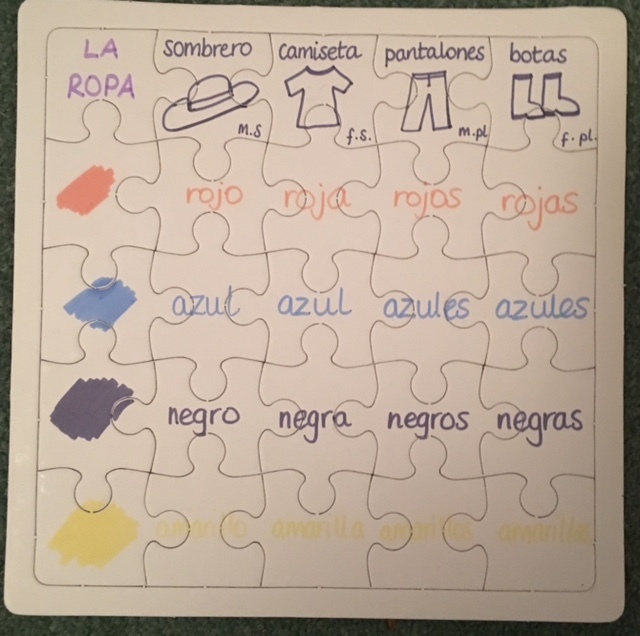 Semillitas de aprendizaje is a bilingual site – in English and Spanish – aimed at children 0-5 years old and their parents. It’s full of games, stories, songs, rhymes and activities in two sections – 0-36 meses and 3-5 años. Juegos digitales which doesn’t mean digital games but finger rhymes! Particularly like the fact that the girl presenting them isn’t a’professional’ singer – much more appealing. My favourite is Las ruedas en el bus. Cuentos – some very simple stories – particularly like La mascota perfecta (link to Querido Zoo?) and No me quiero bañar – a common cry in many homes! Rimas infantiles is also a great section with lots of rhymes – and they’re read to you so you get the right rhythm which can be a bit of a problem. And the adults section gives advice on good books, activities that you can do with your children and also general advice. So, thanks for the tip off! I love it when other people share things with me!